Charlie turned two yesterday. There was poop on the floor, Red Robin meltdowns, cake, and a gift. Tomorrow we have his party with our family. I’m sure I’ll do a huge photo post on Monday, but for now, my brain needs a break from trying to wrap itself around the fact that the BABY of the family is TWO. So Old School Blogging comes at a perfect time this month. Elaine and her co-host of the month, Kim are back with a slew of random questions. I can remember getting surveys like this in emails back in college and I could never say no to a good survey. It’s fun and easy and it’s always fun to read other people’s answers. I’m watching TV right now. Ok maybe I’m playing fast and loose with the word “watching”. The TV is always on in our house. Currently The Big Bang Theory is on because it’s always on somewhere. I was getting out of the car after Charlie’s birthday dinner at Red Robin. I don’t want to talk about it yet. Yes, it was that bad. Let’s just say it went downhill from here. That look on his face should have been all the foreshadowing we needed. I’m in my living room where I have photos, photos, and more photos on the wall. Cortney would make the argument that I may be photo crazy. I have a really hard time covering up old photos with new ones because I still love the old ones so much, so our walls just get fuller and fuller. The first thing I would do is pay off all our debt. I know, I know. That is such a GROWNUP thing to say. So if I didn’t have the adult voice in my head telling me to be responsible, I would totally buy myself a brand new vehicle. Then I would buy Cortney a brand new vehicle. And then we would go on vacation to somewhere warm and all inclusive, because we have never done that before. Oh, and I would buy the world a Coke. Naturally. Most people don’t peg me for one who swears much. I keep it clean in the classroom, here, and in public. But just ask Cortney or any of my friends who have known me a while. It can get ridiculous. Sorry mom. You DID teach me better. Cortney was the last person to call my phone because I couldn’t find it, so he called it. But I had it on silent so that didn’t help. The last legit call was from the salon last week confirming my last Friday appointment. I don’t get many calls. I would tear it down and build a new one. 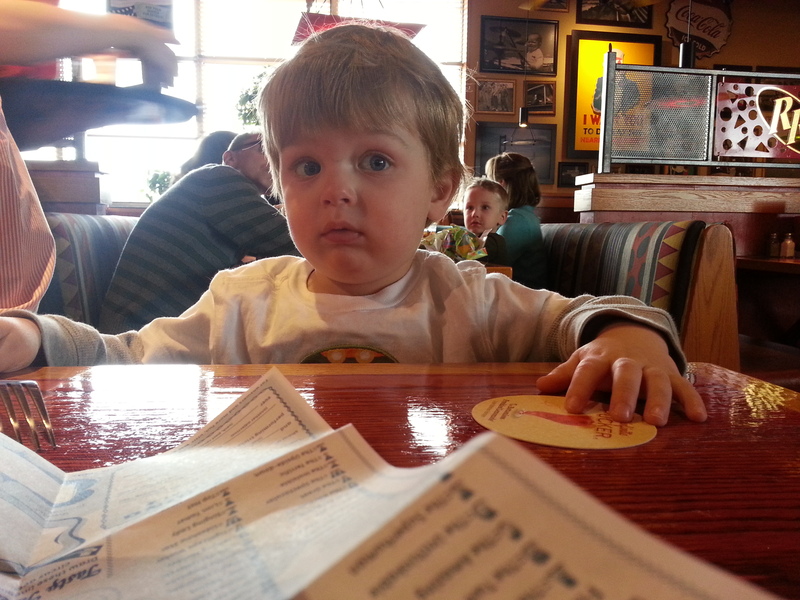 The last thing we paid for was the dinner at Red Robin that no one enjoyed. Actually, I think Eddie enjoyed it. He ate all his food and was very sad we had to leave instead of having Charlie be sung to and handed an ice cream sundae. The last thing I bought on my own was some new books for Eddie. I never know how to answer this question. Because honestly I would probably be way too nervous to enjoy it whomever it was. And if it was the first time I met this famous person, I would blank and not ask them anything for fear they would just be annoyed. And why would they confide in me anyway? Or why would they give me advice? Just some random person they are having ONE lunch with? See. I am too anxiety-ridden for this question. Probably Gap Outlet. Not because I have a love affair with it, but because I can usually find cute stuff there for a good price. Otherwise if Zulily counts as a “store”, I would go with that. Well this depends. Was it an empty glass that you only filled halfway? Because then it’s half full. Or was it a full glass that you drank half of? Because then it’s half empty. I’m going to assume it’s half empty with the possibility of getting a refill. Seattle, Washington with Cortney the year after we got married. Having a drink at the Experience Music Project in Seattle. Tons of dust and some random picture frames and my shoe thingy for off-season shoes. When everyone is together getting along nicely. Whatever time that happens, that is my favorite. People being stronger than their circumstances. So when you have a million bucks, you’ll visit me, yes? Elaine A. recently posted…Old School Blogging, Random is Back! Great answers and thanks for the inspiration! Ann recently posted…Getting out of my blogging rut: Old School Blogging! That dinner sounds like a doozy! I watch Bib Bang Theory a lot as well because, yes, it is always on. I can never decide on a famous person for that question either! We have A LOT in common…tv always on, dust bunnies, everyone getting along. And that is a brilliant answer to the half full/empty question! I added the “first pay off debt” to my answer to the multi-millionaire question too. We are such grown ups. And I know I would be shy if I were to have lunch with someone I didn’t know – let alone someone famous. Or I would just ramble and that would likely be worse. Big Bang is always on somewhere. I’ve been to the Experience Music Project, it’s a pretty cool place. Seattle was one of those places were as an East Coast girl I felt really far from home. Your answer to the house one made me laugh. And the one about the lunch made me think. I said I’d love to have lunch with Tina Fey, but I’m quite sure it would look like us sitting together at a table with me staring and giggling creepily and her glancing around awkwardly.